Cook ground beef and Italian sausage. Drain, then crumble. Into a saute pan, add olive oil. Saute onions and garlic until translucent; remove from heat. 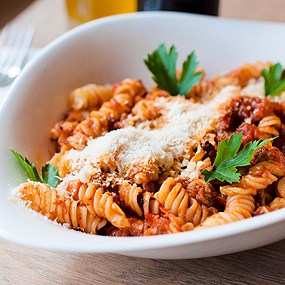 Combine meat, Furmano's Tomato Sauce, Furmano's Crushed Tomatoes, red pepper flakes, and garlic and onion mixture. Add cooked pasta to meat sauce. Put 1/2 of the pasta in bottom of 13 x 9 baking casserole. Add 3/4 of the Italian cheese blend. Top with remaining pasta. Sprinkle remaining Italian cheese blend and parmesan on top.